We will start this review with a supposition that you are carrying a pocket pistol for protection against those who may randomly choose you as a victim because they perceive you are vulnerable. In those instances the sight of any pistol may be enough to dissuade the perpetrator and make them rethink their mistaken assessment of your capabilities. On the other hand, if you are being stalked, threatened, or harassed by someone who is really “out to get you” then you need to have a pistol whose caliber begins with a 4 (and we’ll look at a couple of those in the second part of this review). Let’s start by looking at a few pocket pistols that I used to own but traded off. 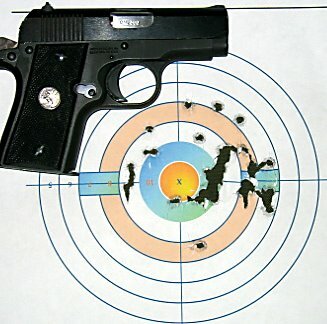 The first is the Seecamp .380 ACP. · As this pistol is for “Up Close and Personal” use it has no sights. For its intended use it probably doesn’t need them, however I feel that that any pistol beingused for defensive purposes should have sights. If a shot went wide and hit an innocent bystander, plaintiff’s attorney would probably make the argument that you were negligent in using a pistol without the capability of proper aiming. In all fairness, despite no sights it was adequately accurate on silhouette targets up to 21 feet. 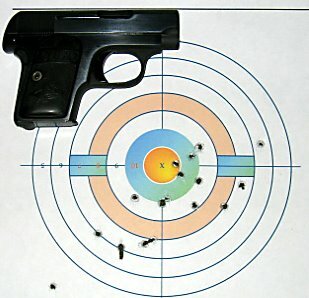 · The trigger pull was long and heavy which, I felt, kept this pistol from attaining better than “just adequate” accuracy. · The pistol kicked like a mule. Due to its fixed barrel the recoil energy has no place to go except right back into your hand. The trigger guard banged up my index finger so badly that I only fired 12 rounds through it before deciding it had to go. The second pistol is the North American Arms Guardian in .32 ACP. This pistol is a very close copy of the Seecamp design. It does however, have rudimentary sights. It weighs 13.5 ounces but still feels heavy and, just like the Seecamp it had a long and heavy trigger pull, employed a fixed barrel and also beat my hand and trigger finger up pretty bad. The third pistol is the Kel-Tec P3AT in .380 ACP. Now this pistol, despite it ugly appearance, stayed with me for a year and a half. Due to its innovative design and use of polymer construction the P3AT only weighed 8.3 ounces and while taller than the Seecamp and the Guardian, the Kel-Tec was very thin at .77 inches wide. From the standpoint of size and weight this is the epitome of a pocket pistol. It also sported better accuracy that the other two pistols. The Kel-Tec is not saddled with a fixed barrel so the recoil was lighter even though the Seecamp and NAA Guardian were full stainless steel pistols. Some people have had feeding or extraction difficulties with their Kel-Tec and had to send them back for a little factory work. I guess I was lucky, mine functioned flawlessly right out of the box. Why did I get rid of it? · Although the trigger pull was lighter it was still fairly long and heavy. Worse yet, the sides of the trigger were very sharp and cut into my trigger finger. My index finger got fairly blistered when shooting up a box of ammo.  · Also, the pistol is not rated for use with high performance ammunition. The manual specifically warns against using Glaser Safety Slugs and any of the MagSafe loads. To me this is a severe disadvantage as the various MagSafe loads are capable of of a velocity of 1700 feet per second and delivering 150 foot pounds of energy. Before I jump into what I shot for this review, I want to talk about two other pistols that I own and, while once considered “state of the art” pocket pistols, I no longer consider them appropriate for that use. The are the Colt Model 1903 Pocket Hammerless in .32 ACP and the Model 1908 Pocket Hammerless in .380 ACP. They are pictured here with the Colt Model 1908 Vest Pocket Hammerless in .25 ACP. As stated in their Model designation this John Browning design goes back to 1903 and 1908 respectively. These pistols were immensely popular and while Colt produced them in the US, Fabrique Nationale in Belguim produced them in Europe. The pistols pictured above were produced in the mid 1920’s and these .32 and .380 pistols are still a great design and Colt executed their manufacture brilliantly. However, by today’s standards, in terms of both design of the pistol and design of clothing they are harder to conceal. The pistols are fairly large for their caliber and clothing styles have changed; pants are snugger fitting than they were in the 20’s, pockets are cut smaller, and men do not wear suit jackets as much as they used to. Still, there is a great coolness to these guns. The design has great lines and is almost Art-Deco in appearance. The pistol also has a rich gangland history in both reality and Hollywood fiction. Both John Dillinger and Bonnie & Clyde were photographed with them. James Cagney, Edward G. Robinson, George Raft, and Humphrey Bogart all sported them in several of their classic movies. They were even employed in Disney’s “Who Framed Roger Rabbit”. Cartoon mogul R.K. Maroon brandished a gold-plated engraved model with Ivory grips and Jessica Rabbit aimed one at Eddie Valliant’s pursuer in a dank Toonville alley. Now then, the first pistol in our Pocket Pistol review is another Colt Hammerless design, the Model 1908 Vest Pocket Hammerless in .25 ACP. This pistol is very, very small but fairly light weight at 13 ounces. A shallow groove along the top of the frame ends in a very miniscule front sight. I didn’t really expect much from this pistol however I was pleasantly surprised. I rolled the target down to 21 feet even though I knew this pistol was designed for “arm’s length” gun fights. I wondered if any of the rounds would even hit the target. The accuracy with Winchester 55 grain FMJ surprised me. The Cor-Bon Glaser Safety Slug fires a 35 grain bullet at 1150 feet per second and delivers 94 foot pounds of energy. Compare this to a 50 grain FMJ bullet which travels at a relatively slow 760 FPS and the Cor-Bon would be the best choice. As the design of the Safety Slug employs a plastic cap over the shot-filled hollowpoint bullet, feeding should not be a problem. The capacity of the Vest Pocket pistol is 6 + 1 and would not be a bad close range pistol if concealment was a priority. Before shooting the Glaser round, however it would be good to check with Cor-Bon as to whether this has been tested in the Vestpocket and have a good gunsmith check the pistol thoroughly to make sure all of the parts are stable. After all, the Cor-Bon is a hot round and the Vest Pocket was manufactured approximately 80 years ago. The next handgun is the Smith & Wesson Model 351PD revolver in .22 Magnum. This small revolver has a Scandium frame with a stainless steel barrel insert. This brings the weight of the gun down to a meager 11 ounces. The 351PD holds 7 rounds and sports a bright orange Hi-Viz fiber optic front sight and, at 21 feet, produced pretty good accuracy. The best round available would appear to be the CCI Maxi-Mag + V which fires a 35 grain projectile at 1153 feet per second. This puts it on par with the Glaser .25 ACP round and while the revolver is larger and bulkier it is a couple of ounces lighter and offers more accuracy. Now we start to move into the realm of more capable calibers. The first pistol is the one I traded in my Kel-Tec on, the Colt Mustang Pocketlite. Even though the frame is an aluminum alloy, it is much heavier than the other pistols reviewed at 23 ¼ ounces, is also wider than the Kel-Tec, but not as tall. The sights are better and since the design is based upon John M. Browning’s legendary model 1911 design, it offers a very light single action pull. It is much more accurate and extremely more pleasant to shoot than the Kel-Tec. MagSafe makes a great defensive .380 round call the Defender. It is rated for alloy framed pistols and fires a 52 grain bullet at a whopping 1620 feet per second delivering 303 foot pounds of energy. None of the prior reviewed handguns are currently produced, but are available on the second hand market. However, the .380 single action colts were not made in a huge quantity so when they are found, they command a hefty price. Expect to pay somewhere north of $500 for one is good shape. In terms of the .22 Magnum, S & W has only recently removed them from their catalogue, so they are still available on the dealer’s shelves. And…the good thing about Smith & Wesson is “everything old is new again”. This is at least the 4th version of a .22 Mag revolver that I can recall and if you are patient, they will reintroduce it in another configuration eventually. 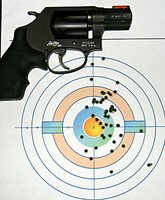 This brings us to the last pocket gun reviewed, the Smith & Wesson 340PD in .38 Special. Again this is a Scandium frame revolver with a stainless steel barrel insert and a titanium cylinder. It weighs 12 ounces, which is to say that it weighs virtually nothing. In fact, while I don’t have a scale, the five bullets probably double the weight of the gun. It also has a Hi-Viz fiber optic front sight, this time in green. This revolver is hammerless and has much less of a chance of snagging on a pocket or jacket when presented. It is a handful to shoot, but not impossible, and is capable of good accuracy. I replaced the Hogue Ultra Compact Rubber grips with some fake stag grips from Ajax and a Tyler T-Grip adapter. While I like the appearance, I may try some Hogue checkered wood grips which will offer better control with a handsome appearance. Undoubtedly the best load is the Speer Short Barrel Gold Dot 135 grain + P which rates 860 feet per second with 222 foot pounds of energy. Another advantage of the .38 Special over the other handguns listed is the heavier hollowpoint bullet. 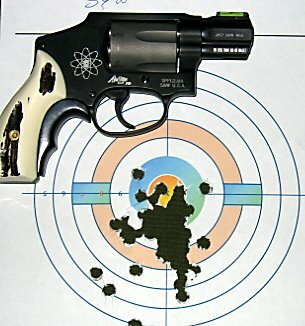 There is a better chance of more internal damage being done with the .38 and thus, gives this revolver the edge of the others reviewed if power is a priority over concealment.